Bookmaker 22Bet is one of the latest European betting sites to start accepting customers in Nigeria, with our review taking a detailed look at their entire operation, including everything from their range of markets to promotions. However, let’s kick things off by taking a closer look at the history of 22Bet. 22Bet was established back in 2007, meaning that they now have over a decades worth of experience to their name within the industry. However, it is over recent years where they have achieved significant growth, with the bookmaker being licensed by the Government of Curacao, one of the most respected authorities in the gambling world. 22Bet now offer a good all-round betting platform, featuring a range of sports markets and competitive odds. The following are among the standout pros and cons of the 22Bet sportsbook, offering those looking for a new betting site a clear understanding of exactly what it is that they offer. It is markets including football, tennis and golf that offer the most depth, with games from around the world covered by 22Bet. In fact, there was over 1,000 football betting options at the time of writing this review, along with 500 between the other two sports mentioned. Elsewhere, popular sports in Nigeria also feature heavily, including basketball and boxing, meaning that customers are always likely to find something to suit their needs. 22Bet also score highly when it comes to the odds in which they offer, especially when it comes to popular sports including football, tennis and cricket. Footall payouts sit as high as 97% at times, which enables the bookmaker to compete with even the best-known bookmakers within the industry today. 22Bet have worked hard in order to ensure that their website is as easy to use as possible, with the bookmaker having made significant changes in this area recently. As a result, their sportsbook is now a platform that offers easy access to all market and features, while there is no unnecessary information as was previously found. All sports markets are conveniently listed down the left-hand side of the page, while customers can also move easily between 22Bet’s live betting, casino, payments and promotions pages thanks to links at the top of the page. A green and white colour scheme dominates throughout, while a small amount of imagery and graphics are used in order to separate features and additional pages. The 22Bet website is also available in a huge number of languages, catering for a range of customers in the process. 22Bet performs well when it comes to their options for mobile customers too, with an easy to use app accompanying their website, which is accesible via a range of mobile browsers. 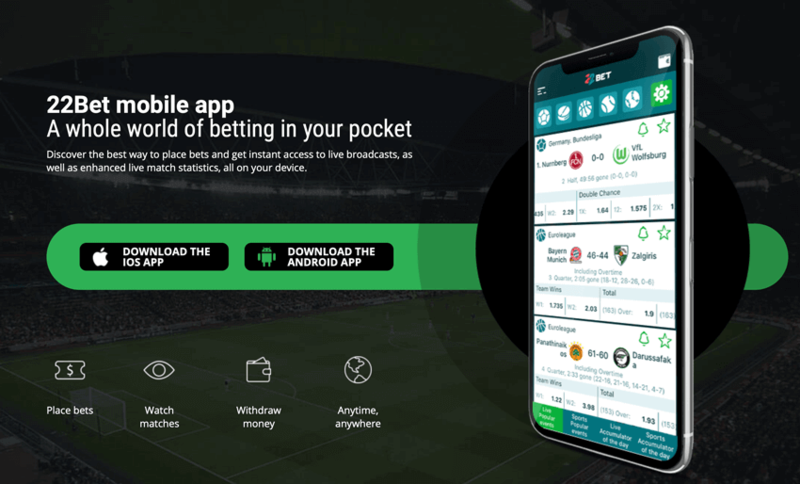 The 22Bet app can be downloaded free of charge using both iOS and Android devices, with this platform allowing users tot take advantage of features including live streaming, in-play betting and customer support when on the move. However, for those not wishing to download another app onto their device, punters will be pleased to know that the 22Bet website works well on mobiles too, however the speed will be slightly slower in general. Along with their vast variety of betting markets, 22Bet have also ensured that their betting coverage is as good as possible when it comes to the depth of markets. As a result, both high-profile events and more regional encounters are all available to bet on, with fans of football, tennis, basketball and golf likely to be especially pleased with the bookmakers coverage. Whether it be action from the English Football Championship, Challenger tennis Tour or Euro Basket league, 22Bet have things covered. Those that enjoy live betting will certainly be impressed with the number of opportunities available at 22Bet, with the bookmaker having a dedicated in-play page on their sportsbook. 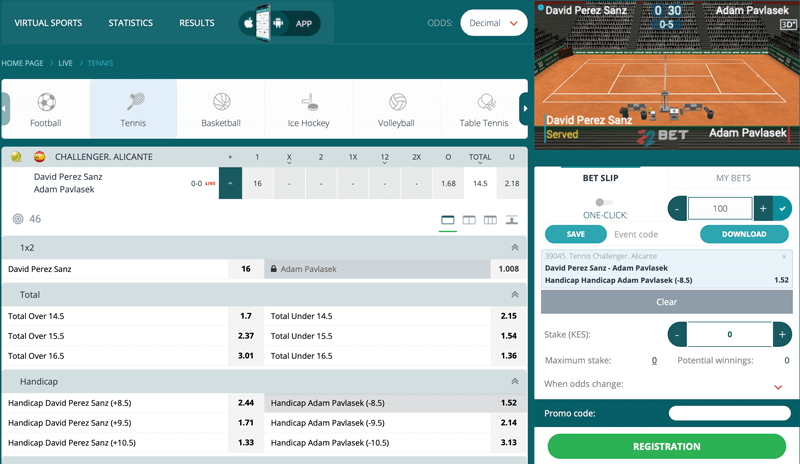 All current live betting markets are immediately accessible upon entering the 22Bet website, with markets being separated into individual sports. Sports such as football, tennis, basketball, volleyball and handball regularly feature, with odds from these markets being regularly updated in accordance with the action as it unfolds. In total, there were over 200 live betting markets at the time of writing this review, with this number only increasing over weekends. Potential customers will also be pleased to know that live streaming is also available at 22Bet, allowing them to simultaneously watch and bet upon sporting action from around the world on a daily basis. In order to gain access to such streams via desktop or mobile, punters must either have a positive account balance of have placed a bet on the game in which they wish to view. Footall tennis and basketball are just three of the sports to feature heavily in this area at 22Bet, with this feature only adding to the excitement of betting. Nigerian-based customers registering a new account at 22Bet are able to earn themselves a 100% matched deposit bonus, worth up to a maximum of 50,000 NGN. Simply sign-up with the bookmaker, before making a qualifying deposit, which 22Bet will 100% match, providing the perfect platform to kick-start your sports betting on. As well as this, the unstrict wagering requirements surrounding the offer means that making withdrawals using bonus funds from this promotion are actually quite realistic, unlike other such offers in the industry today. Elsewhere, the bookmaker also deliver a small number of promotions that are available to existing customers, which offer punters the chance to earn free bets, bonuses and cash-back. As soon as you enter the 22Bet website, one of the first things in which customers will notice is the “Ask a Qustion” tab located at the bottom of the page. Acting as something of a live chat service, online consultants are available to talk to in just a matter of minutes in most cases, offering a hugely efficient method of support. Elsewhere, a range of email address are available to contact, which include security, technical and partnership departments. Response times in this area are good at less than 24 hours, however there is no telephone number available to customers at present. The bookmaker also offers a good amount of hints and guides when it comes to operating on their website, acting as something of a FAQ page, providing answers to commonly asked questions. 22Bet has quickly become one of the best betting sites available to customers in Nigeria, with the bookmaker having introduced a number of appealing markets and features. If the ability to bet on sporting action from around the world is not sufficient, watching games through 22Bet’s live streaming service, cashing out bets before their completion or using bonus funds earned through generous promotions should be enough to tempt you. The range of markets available at 22Bet is second to none too, with everything from football and tennis to skiing and trotting being available. Customers can also rest assured that 22Bet are nothing but a reliable and trustworthy bookmaker, thanks to the range of security measures that have been put in place, along with the fact that they are licensed by the Government of Curacao. An SSL encryption is used in order to ensure that all transactions are processed securely, as well as avoiding any risk of fraud from third parties. It is clear from our review that 22Bet are an excellent option for betting customers in Nigeria, with the bookmaker having made vast improvements to their platforms over recent times. A generous welcome bonus is on offer in Naira, providing a good platform to build upon, while the sheer volume of sports markets should cater for even the most demanding of customers. The odds on offer at 22Bet also allow for some significant earnings to be made, especially when it comes to disciplines including football, tennis and basketball. 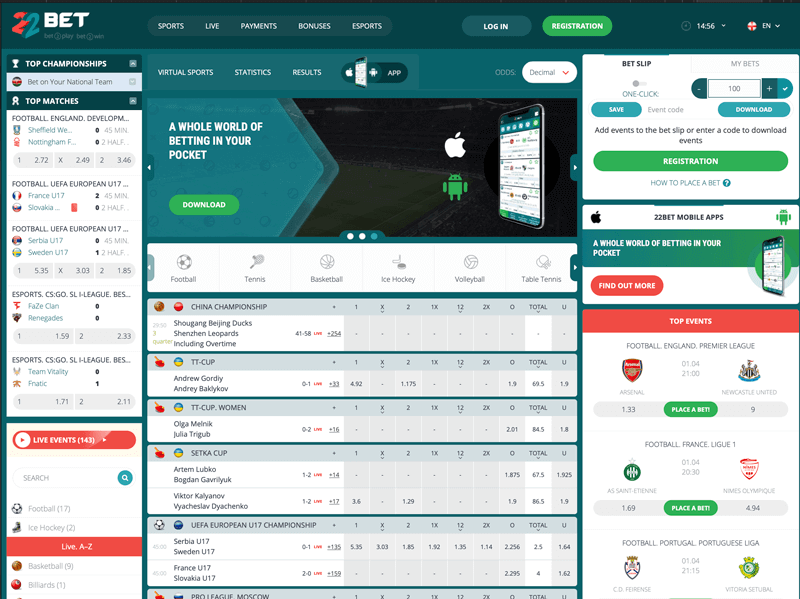 While improvements can certainly still be made when it comes to banking and customer support, 22Bet offer an excellent all-round platform, which is well worth considering for punters based in Nigeria.